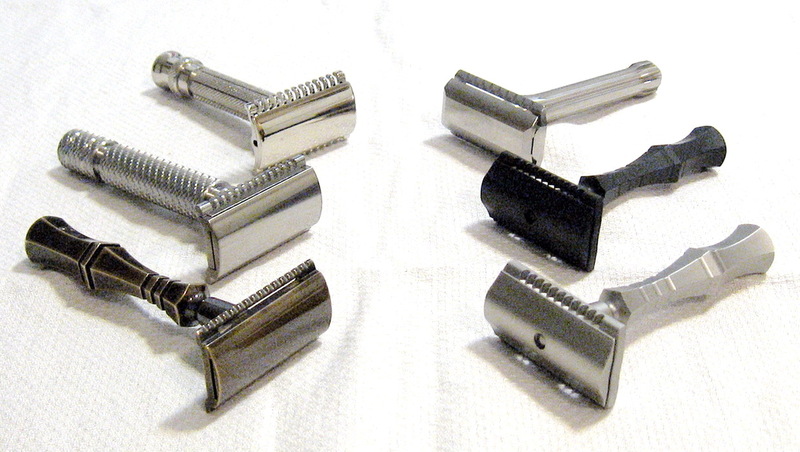 Let's talk about single and double edged razors and the blades that they use. I've picked up a few new razors: Wolfman WR1-SB Antique Bronze/Darwin, Wolfman WR2-DC/WRH7 Titanium, Gillette New on a Bob's Razor Works Bull Mastiff handle, Blackland Blackbird Machined, Asylum Evolution Black Oxide, and Asylum Evolution Machined. I probably will not keep all of them. Well, I want the experience of trying them all. No doubt I'll only keep 2 or 3. Quite a spread there, John! I hope the Asylum handles are more comfortable to hold than they look. Murray, the handle of the machined Evolution is very comfortable to hold. It is not slippery at all or unstable. And the razor shaves nicely with a vintage Gillette Platinum Plus blade, pretty much equivalent in aggressiveness and efficiency to my Weber polished head.